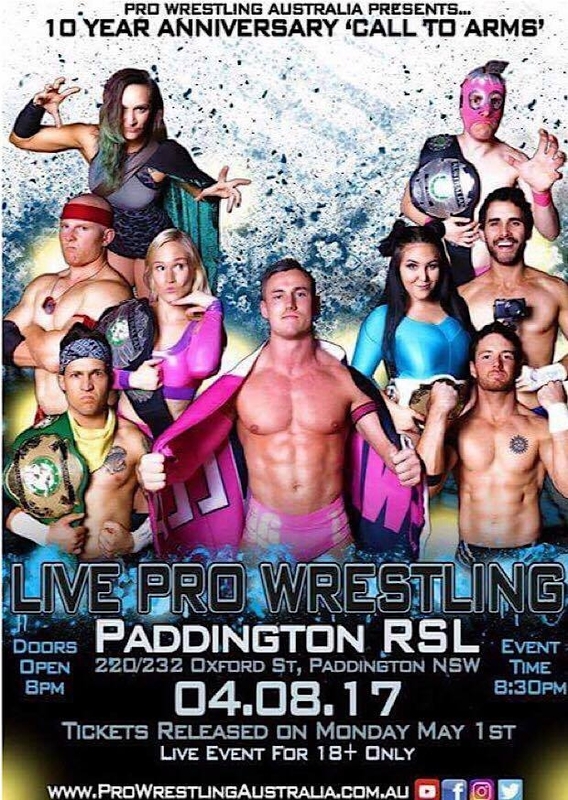 Pro Wrestling Australia comes to Paddington RSL for the first time ever, holding the historic event CALL TO ARMS! FEATURING International Wrestling Superstar Will Ospreay! Call to Arms was the first ever Pro Wrestling Australia card (known back then as PWA Elite) featuring matches of Australia's best Professional Wrestlers gunning for the top spot. Now we look 10 years on, and celebrate PWA's decade of existence with what will arguably be the biggest event Pro Wrestling Australia has ever hosted. As announced on Pro Wrestling Australia's Social Media accounts Sunday 30th of April 2017, Will Ospreay will be hitting Australian shores and debuting for PWA at Call to Arms! Star of Progress Wrestling, Ring of Honor & New Japan Pro Wrestling amongst many more companies worldwide will make his Australian debut at the 10 Year Anniversary for PWA. Tickets to go on sale Monday May 1st 2017 at 10 AM! Register now to get a notification upon ticket release. Otherwise stay tuned to www.prowrestlingaustralia.com.au for further information!